Donald Trump’s apparent slide in the polls is continuing, and with that more states seem to be coming into play. 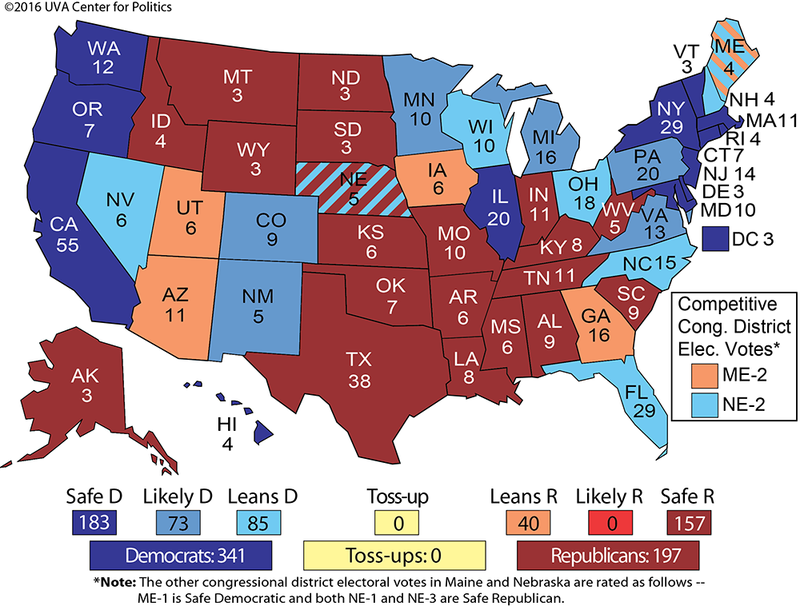 We already moved heavily Republican Utah to Leans Republican earlier this week, a decision that was backed up by a recent Deseret News poll showing Clinton and Trump tied at 26% apiece, with independent Republican candidate Evan McMullin, a Mormon who has been focusing on the Mormon-majority state, running a close third at 22%. It now appears that Georgia, like Arizona, is also moving back into play. There have been several reports of close polls there and the Clinton campaign might try to make a move for this reliably Republican state. We’re moving it back to Leans Republican, from Likely Republican, matching Arizona’s race rating. Needless to say, a Clinton win in Arizona or Georgia would be evidence of a Clinton rout that matches or exceeds Obama’s seven-point 2008 romp.